For the animated film, see The Lion of Judah. The Lion of Judah is also mentioned in the Book of Revelation, as a term representing Jesus, according to Christian theology. The lion of Judah was also one of the titles of the Solomonic Emperors of Ethiopia. It was depicted on a map of the Upper Nile published in 1683 by the Italian Jobi Ludolfi describing the Lion of Judah symbol as the Royal Insignia of the Ethiopian empire. The Solomonic dynasty of Ethiopia lasted three thousand years according and has its patrilineal origin in the Israelite Royal House of Judah. The Lion of Judah served as the hereditary title of the Solomonic Ethiopian emperors including Menelik and Haile Selassie and was depicted on the flag of Ethiopia from 1897 to 1974. Due to its association with Haile Selassie, it continues to be an important symbol among members of the Rastafari movement. The biblical Judah (in Hebrew: Yehuda) is the eponymous ancestor of the Tribe of Judah, which is traditionally symbolized by a lion. In Genesis, the patriarch Jacob ("Israel") gave that symbol to this tribe when he refers to his son Judah as a Gur Aryeh גּוּר אַרְיֵה יְהוּדָה, "Young Lion" (Genesis 49:9) when blessing him. In Jewish naming tradition the Hebrew name and the substitute name are often combined as a pair, as in this case. The Lion of Judah was used as a Jewish symbol for many years, and as Jerusalem was the capital of the Kingdom of Judah, in 1950 it was included in the Emblem of Jerusalem. Ethiopia's history as recorded and elaborated in a 13th-century treatise, the Kebre Negest, asserts descent from a retinue of Israelites who returned with Makeda, the Queen of Sheba from her visit to King Solomon in Jerusalem, by whom she had conceived the Solomonic dynasty's founder Menelik I. As Solomon was of the tribe of Judah, his son Menelik I would continue the line, which according to Ethiopian history was passed directly down from king to king until Emperor Haile Selassie I (ostensibly the 225th king from King David) was deposed in 1974. Both Christian and Jewish Ethiopian history have it that there were also immigrants of the Tribes of Dan and Judah that accompanied Makeda back from her visit to Solomon; hence the Ge'ez motto Mo`a 'Anbessa Ze'imnegede Yihuda ("The Lion of Judah has conquered"), included among the titles of the Emperor throughout the Solomonic Dynasty. It is unknown whether John of Patmos was directly aware of this hereditary title when he penned it into the text of the prophecy. The Lion of Judah motif figured prominently on the old imperial flag, currency, stamps, etc. and may still be seen gracing the terrace of the capital as a national symbol. After the collapse of the Communist Derg in 1990 and the increase of Western-style political freedoms, a minor political party bearing the name Mo'a Anbessa made its appearance. Imperial Flag Haile Selassie of Ethiopia, with the Lion of Judah, the cross scepter and four stars of David. The Lion of Judah is a prominent symbol in the Rastafari movement. It represents Emperor Haile Selassie I as well as being a symbol of strength, kingship, pride and African sovereignty. Rastafari consider the mention of "The Lion of Judah" in Genesis 49:9 and Revelation 5:5 of The Bible to refer to Emperor Haile Selassie I. Rastafari hail Haile Selassie I with the titles "KING of Kings, LORD of lords, Conquering Lion of Judah, Elect of God, the Light of the World". The phrase appears in the New Testament in Revelation 5:5: "And one of the elders saith unto me, Weep not: behold, the Lion of the tribe of Judah, the Root of David, hath prevailed to open the book, and to loose the seven seals thereof." This is widely regarded as a reference to Jesus among Christians. Many Christian organizations and ministries use the lion of Judah as their emblem or even as their name. Inspired by the Lion of Judah, C. S. Lewis used a lion named Aslan to represent Jesus in The Chronicles of Narnia. Mosaic of the Ethiopian Consulate in Jerusalem. Enrollment in ge'ez: "The Lion of Judah has triumphed." Traditional Monument in Addis Ababa. ^ "Genesis 49:9". Biblos. Archived from the original on 17 February 2015. Retrieved 1 December 2014. ^ "Revelation 5:5". Bible Study Tools. Archived from the original on 19 January 2015. Retrieved 1 December 2014. ^ "Rastafarians". flagspot.net. Archived from the original on 2015-09-29. ^ "Genesis : Chapter 49". Bible.ort.org. Archived from the original on 2011-07-09. Retrieved 2015-03-05. ^ Adem, Seifudein. "The Lion of Judah in the New World: Emperor Haile Selassie of Ethiopia and the shaping of Americans' attitude toward Africa by Vestal T.Santa Barbara, CA: Praeger, 2011. Pp. 231, $44.95 (hbk)". The Journal of Modern African Studies. 50 (3): 541–542. doi:10.1017/S0022278X12000286. Archived from the original on 2017-01-07 – via Cambridge Core. ^ "KEBRA NAGAST Ethiopic Text & Manuscript - The Lion Of Judah Society". The Lion Of Judah Society. Archived from the original on 2017-01-07. ^ Barnett, Michael; Onuora, Adwoa Ntozake (2014). "Rastafari as Afrocentrically Based Discourse and Spiritual Expression". Rastafari in the New Millennium: A Rastafari Reader. Syracuse University Press. ^ Chislom, Clinton (1998). "The Rasta-Selassie-Ethiopian Connections". In Murrel, Nathaniel Samuel; et al. (eds.). Chanting Down Babylon: The Rastafari Reader. Temple University Press. p. 171. Archived from the original on 2016-09-18. ^ "Liam Neeson says Narnia's Aslan could be Muhammed | Christian News on Christian Today". Christiantoday.com. 2010-12-09. Retrieved 2015-03-05. ^ "C.S. Lewis: A Complete Guide to His Life & Works - Google Books". Books.google.com. 1998-06-23. Retrieved 2015-03-05. ^ "NarniaWeb Community Forums • View topic - Allegorical Aslan - C.S. Lewis Quote". Forum.narniaweb.com. Archived from the original on 2014-05-24. Retrieved 2015-03-05. ^ "C S Lewis Letter Testifies Narnia's Lion as Christ | Christian News on Christian Today". Christiantoday.com. 2005-12-07. Retrieved 2015-03-05. 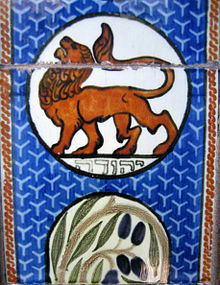 Wikimedia Commons has media related to Lion of Judah.